Flips Invitational Meet, hosted by MGC Westboro, over the St. Patrick’s Day weekend. 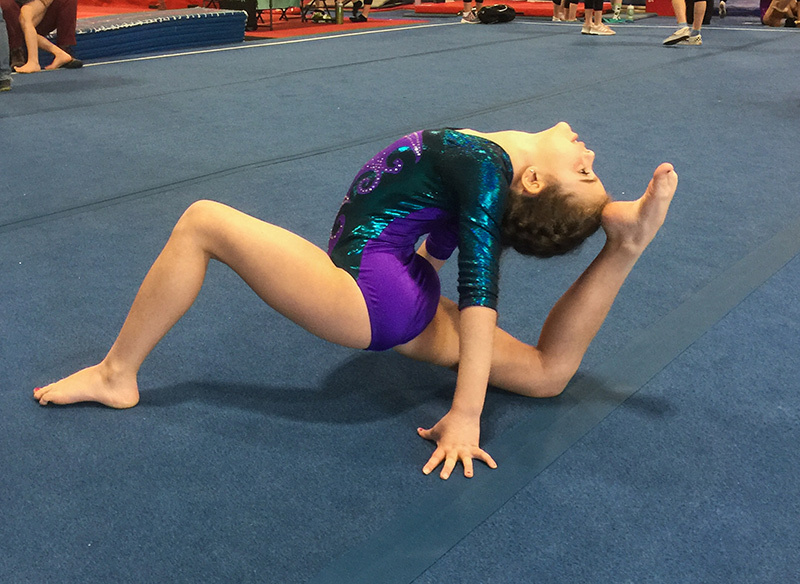 Saturday night, the XCEL Gold and Platinum gymnasts competed in a field filled with older gymnasts. All four gymnasts had personal best All-Around scores. The solo XCEL Gold gymnast, Emily Boyd, had a personal best in the uneven bars with a 9.05 and personal best All-Around score of 35.55, placing fifth All-Around in her division. In the XCEL Platinum division, Arianna Edelman had personal bests on bars with a 9.4 (second place) and floor with a 9.55 (second place). Arianna also placed eighth on beam with a 9.0. Sara Goodale scored personal bests in vault with a 9.3 (fifth place), beam with a 8.9 (seventh place), and floor with a 9.35 (eighth place). Molly Crawford had a personal best on floor with 9.25, and placed eighth on bars with a 9.0. In the All-Around, Arianna placed fourth (36.65), Sara placed eighth (36.3), and Molly placed 12th (35.9). Sara was also recognized for the best full turn on beam and best smile on floor. Molly Crawford won the handstand contest. 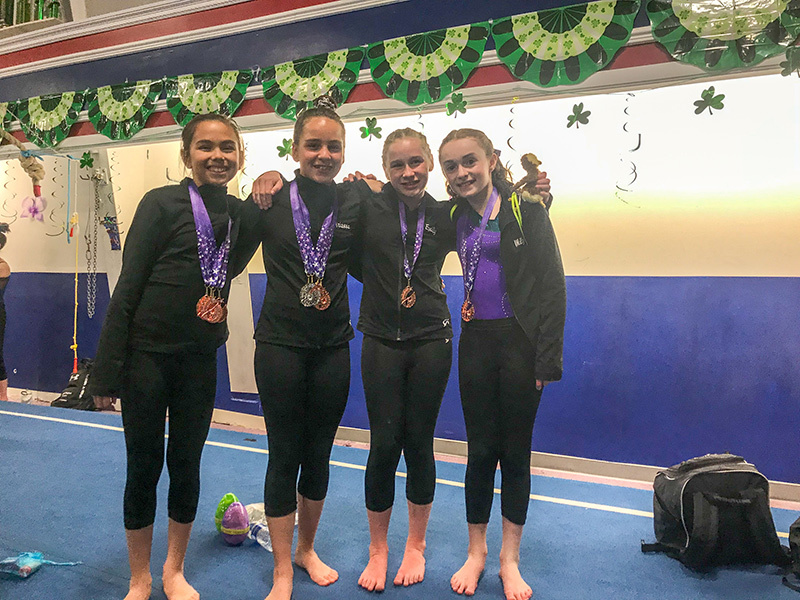 The six XCEL Bronze gymnasts were divided into Child, Junior A, and Junior B divisions. In the Child Division, Casey Webster placed first on bars with a 9.6 (matching a personal best) and eighth All-Around with a 36.45. In the same division, Josee Winston-Feder had personal bests on vault with an 8.85, beam with a 9.0, and floor with a 9.25. Her All-Around score of 36.3 ranked her 10th and improved her personal best by almost two full points. Stela Thulin had personal bests on bars (9.0), beam (9.0), and floor (9.45, placing fourth), earning 13th place with an All-Around score of 34.75. In the Junior A Division, Abigail Henry posted personal bests on vault (8.9), bars (9.35, fifth place), and beam (9.4, seventh place). She also placed seventh on floor with a 9.3. Her All-Around score of 36.95 placed her seventh, and was another personal best. Autumn Wiggin had a personal best on beam with a 9.25, and placed 12th in her division with a personal best All-Around score of 36.15. The single gymnast in the Junior B division, Madelyn Crowell, placed first in bars (9.45), third on beam (9.35), and second on floor (9.4). All scores were personal bests. Madelyn placed third All-Around in her division with a personal best AA score of 36.9. In addition, Casey Webster won the handstand contest, and Stela Thulin won the “most creative ending on floor” contest for their session. 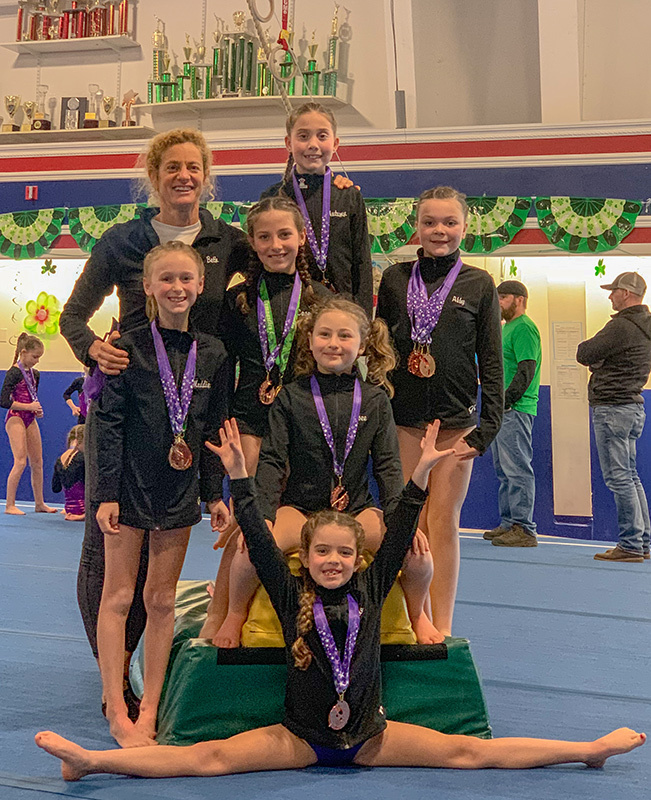 Competing at the XCEL Silver level, the duo of Nikita Kleeman and Grace Voshell rounded off the weekend with strong performances. Nikita placed third on floor with a 9.45 and fifth on both beam (9.4) and bars (9.04). 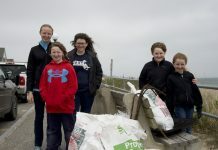 All three scores were personal bests. Grace’s strongest event was floor with a personal best 9.05. Nikita placed sixth All-Around with a 36.7, and Grace placed 10th All-Around with a 35.2. Island Gymnasts are coached by Beth Goodall, who was “thrilled that all the girls made such huge improvements and learned so much that will help us for our championship meets in the next few weeks.” This was the final invitational meet of the season for the gymnasts, who now turn their attention to preparing for Districts and States.